We encourage you to consider all the different kinds of water features that you can design into your future swimming pool. These features can be a fountain, a waterfall, a spillover spa, a rain curtain, and many more. Our team of experts can build any of the water features you want to incorporate into your backyard oasis. 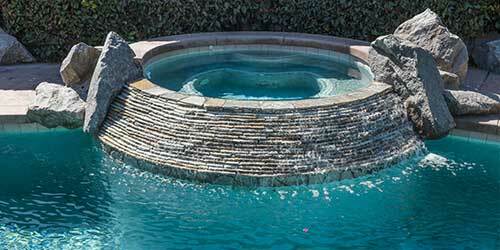 Water features can help enhance the experience of swimming in your dream pool. Our design team is highly skilled when it comes to the technical aspects of constructing water features for your swimming pool. Simple additions to your pool can make a world of a difference. Contact Pools by Design today to learn more about all the different features you can incorporate into your swimming pool. Simple water features can make a world of a difference. 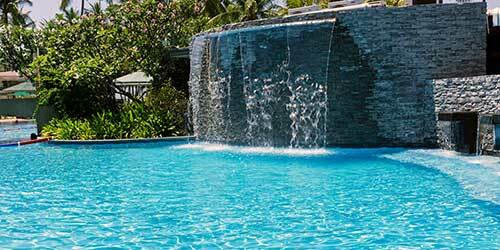 They make your swimming pool more fun, appear more intricate, and enhance the overall value of your home. A spillover spa is when a custom-designed spa is built above the pool. This then becomes a sort of utilitarian water feature when it spills or trickles into the swimming pool.This feature is pleasing to watch and contribute to. Many people customize this feature into their backyard oasis because of the aesthetic appeal it adds to their backyard property. It makes the place itself look more luxurious and fancy. A rain curtain can come in all different styles. This is a wide sheet of water that can be placed onto a wall, one that falls into the pool, or even overhung on the roof. There are endless ways you can design a rain curtain into your pool oasis. This is a very deluxe and extravagant looking water feature, which makes your backyard oasis appear very opulent. This feature can be expensive, but since it enhances the value of your home, it is worth the money. This is probably the most common type of water feature that homeowners build in their pool. 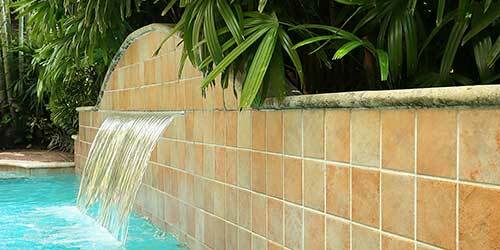 You can customize your waterfall wherever you would like in your pool as well as how you want it to look. A pool waterfall, in particular, spills out from a horizontal spout placed on a tiled or decorative wall near the pool. This can be a fun water feature, especially for children, to swim through or under. It costs more money to build this into the design of the pool, which increases the value of your home. 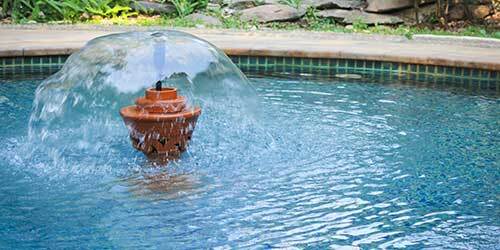 From spillovers to floating, there are many different ways you can incorporate a fountain into your pool. You can place your fountains along the edges to give a sprinkler look or you can even put it outside the pool alongside your landscaping to enhance the look of your swimming oasis. Our team are skilled in all of the capabilities you can build a fountain in. They can be coming out of the walls, in the shallow or deep end, or over the pool. Regardless of you expectations, we can work with you to see all of the possibilities for your pool.